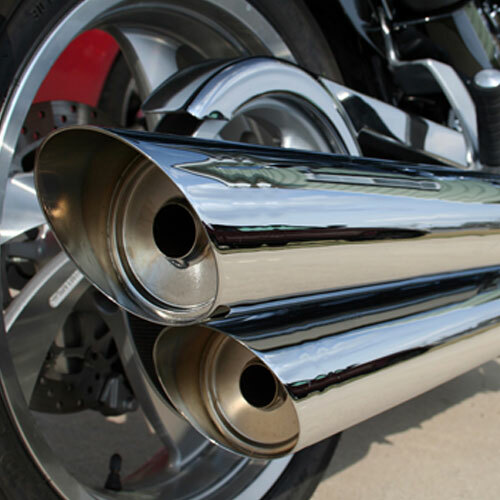 A leading motorcycle manufacturer needed to reduce the amount of shock produced from an electromechanical muffler exhaust actuator without altering the design of their specialized exhaust system. They contacted Polymer Technologies to help them think inside the box to develop a custom solution. The motorcycle original equipment manufacturer (OEM) developed a sophisticated and unique exhaust system that incorporated an electromechanical actuator. The actuator opened and closed a baffle plate in the muffler, allowing the bike to operate in two different ways depending on the rider’s preference. Closing the baffle caused the motorcycle to run very quietly, making it suitable for operating in residential areas. Opening the baffle created a straight through muffler for increased performance on the open road. Understanding the need for an isolator to protect the actuator, the motorcycle OEM had contacted a leading vibration isolation manufacturer. This materials manufacturer stipulated the need for over 5” of design space within the exhaust system. The additional 5” would allow for an appropriately sized isolator to reduce the shock energy from the motorcycle’s current 40+ G's to the desired 15 G's. This stipulation caused the motorcycle OEM to put on the brakes as they wanted to maintain the original design and functionality of their exhaust system. That’s when they turned to Polymer Technologies. Unlike the other manufacturer, Polymer Technologies was willing to work within the existing design constraints to come up with a noise reduction solution. After providing us with their requirements, we were able to work one-on-one with the motorcycle manufacturer to develop an ideal solution. The experts at our Polymer Molded Products Division (PMP) determined that a POLYFORM® molded urethane foam would offer the necessary resilience to isolate the actuator, as well as maintain the durability needed to live within the intended environment. We were able to design a foam insulation that required only 2.5" of space to reduce the measured shock energy for the current 40+ Gs down to just 11 Gs, while compressing the foam a mere 5/8". The manufacturer was able to implement the molded foam in their exhaust system and eliminate warranty claims for premature failure of the actuator. Not only was the manufacturer able to fix their energy management problem, but they were also able to keep their original design intact. Taking time to consider the possibilities of molded foam at the start of a project can help OEMs design products with noise, vibration, and temperature control in mind from the start. Prevent the frustration of having to go back to the drawing board by working with a dedicated custom molded foam supplier. Improve not only the functionality of equipment but assembly time and cost too with a molded solution! If the possibilities of molded foam excite you, then be bold and develop your own custom mold with us, the experts at Polymer Technologies.